“For the Argentina that we all want, we say ENOUGH (STOP!). ENOUGH of the lack of medication, of shackled imports and exports, of trapping of the dollar, of verbal violence, of expropriation, of hooliganism, of impunity, of authoritarianism, of the lack of dialogue, of insecurity, of corruption. 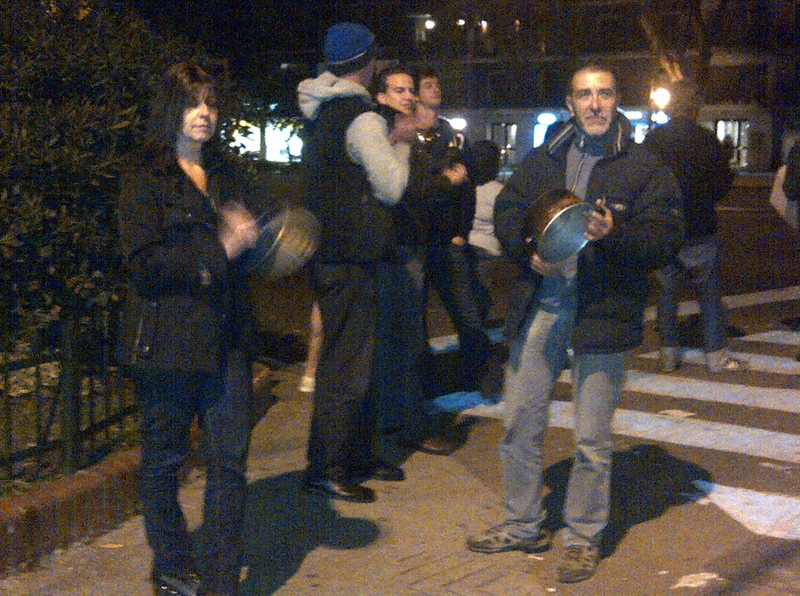 In my first post, I referenced a protest that consists of banging pots and pans, or a CACEROLAZO. 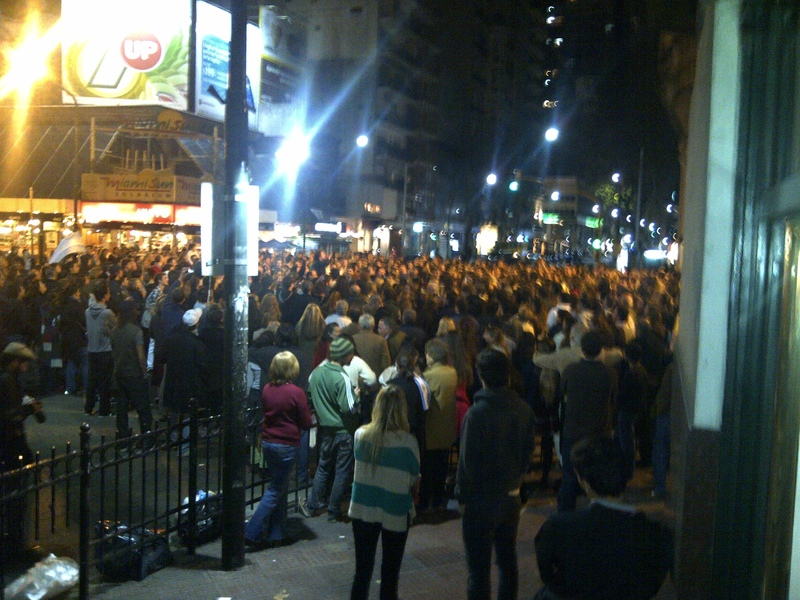 While this story has been picked up by the Associated Press, I wanted to provide some insight into the significance of these protests, and how they differ from the multiple protests that you can regularly witness when strolling around downtown Buenos Aires any given weekday. Argentina is known for its myriad of protests against price increases, lack of wage increases, benefits for veterans, laws regulating the sale of goods on the street, lack of funding for schools, increases in subway prices… this list could literally go on for pages. What’s more, these protests are accompanied by much more disruptive behavior than simply some clanging pots and pans from balconies and street corners long after business hours. These protests regularly cut off major avenues, involve loud drums and explosions, and have police and even military presence, yet are treated as commonplace occurrences, as if a minor traffic collision were to occur in New York or Washington DC. The reason these protests pique the attention of anyone keeping an eye on Argentina’s economy is because they are out of place. Cacerolazos were the primary means of demonstration by middle class Argentines in the 2001-2002 financial crisis, who lost their savings in the corralito that froze dollar accounts and effectively wiped out 75% of the value of their savings. These people took to the streets to loudly but nonviolently express their discontent with the forced conversion of their dollars into pesos at 4 to 1. 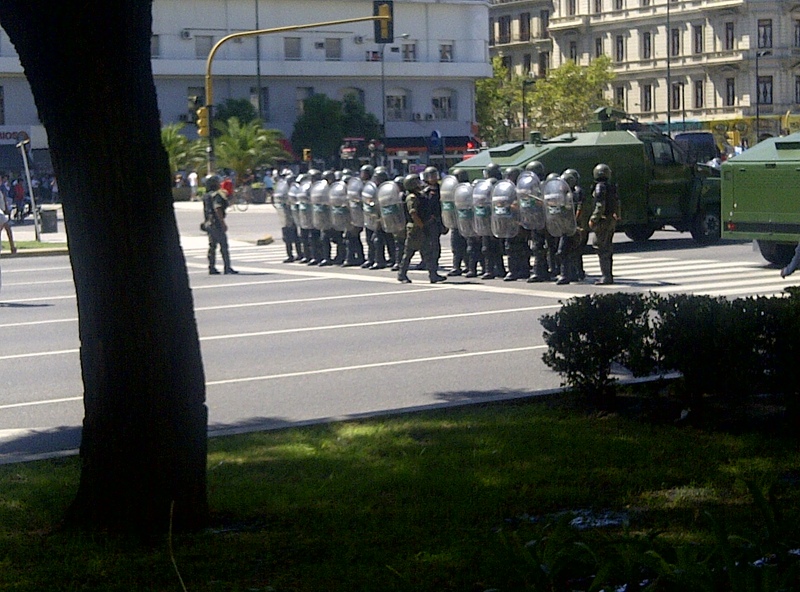 The majority of protests in Argentina are organized by lower and lower-middle class labor unions and politically connected organizers intent on attracting attention to their cause by disrupting the normal flow of life. With the exception of protests by the veterans of the Falklands war, the participants are primarily younger to middle aged students and workers. The nights of Thursday the 31st and Friday the 1st, the streets of the upper class neighborhoods of Buenos Aires echoed with the constant metallic ring of pots and pans being struck. Strolling through the streets I encountered families with young children, elderly couples who looked like they were from a different time, and students and workers alike. I spoke with a handful of Cacerolazo protestors and supporters of the demonstrations to respectfully ask them if they were protesting for more bacon. The general sentiment was that the recent measures by the government to restrict the currency, further restrict imports, and reform to increase taxes on agrarian land were counter to what they wanted for their country. I saw many signs with messages along the lines of: “My government does not represent me.” Individuals that I spoke with informed me that the purpose of the Cacerolazo is to express discontent without disturbing day to day business, and in a nonviolent manner that is nonetheless impossible to ignore. While the din of pots and pans no longer marks the streets of the city by night, I am inclined to agree that as silly as it sounds, there is an ominous note to hearing the constant clanging for hours at a time. 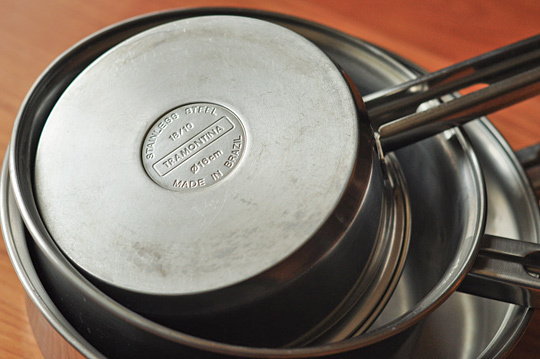 Though I doubt there are enough pots and pans have any effect on the restrictions and policies of the Kirchner government, especially because a good deal of kitchenware in Argentina is imported from Brazil. Hope to hear more from you….but I have to ask, Argentina is a big country, but the Buenos Aires metro is listed at a population (greater metro) of appx 13 million. And in a country of 41.3 million, or over 30% of the country’s entire population lives in the greater BA metro. That’s nuts, no wonder the place stays screwed up. For an American comparison, a New York City, LA, Chicago, or Greater Dallas-Ft. Worth would have over 97 million people. The concentration of the population in the capital is an issue I plan on addressing when I delve into import and export restrictions. The answer is that yes, the population is highly concentrated in Buenos Aires Province and more so in the capital. When looking at the concentration of the population, also take a look at concentration of wealth and the distribution of employment by industry. Argentina is a fascinating case and I look forward to discussing it with you and all of my readers. Seems Kristina is succeeding in converting a gray market into a true black market.